Thornton Hibs’ impressive run came to an end when they were soundly beaten 4-1 by Forfar West End in the East Superleague. With seven straight wins going into this game, Thornton were brought crashing back to earth and it has to be said that they were the architects of their own downfall with some uncharacteristic sloppy defending. The defeat sees the Hibs remain in third place with Forfar narrowing the gap to four points in fourth with their fifth win of the season. Having conceded just two goals in their previous seven outings, incredibly the Hibs found themselves two down in just 14 minutes with Craig Batchelor netting both of them. However, only a top drawer save from Gary Thain before half-time prevented Garry Thomson from pulling one back. The Hibs’ top scorer enjoyed better luck in the 52nd minute when Thain made another good save, this time from Shaun Keatings, only for the ball to fall into Thomson’s path and he made no mistake from close range. Thornton’s task was made more difficult when Max Coleman was ordered off for speaking out of turn to the referee but, despite this handicap, they still had plenty of possession although the visitors were looking dangerous on the break. 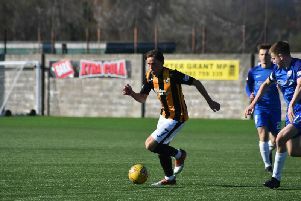 In the 77th minute, Jamie Montgomery raced clear and rounded Ryan Linton before guiding the ball into the unguarded net to re-establish the visitors two-goal advantage. Deep into stoppage time Batchelor completed his second hat-trick of the season from the penalty spot giving Craig Gilbert some food for thought ahead of next week’s fourth round Scottish Junior Cup-tie against Renfrew. Thornton Hibs: Linton, Robertson, A.Drummond, S.Drummond, Hepburn, Orrock, Keatings, Coleman, Anthony, Thomson, Adam. Subs: Malcolm, Shields, Millar, Crichton, Ireland.